One of the lost buildings of Yorkshire. A Palladian mansion of two and a half stories, built from brick, in Flemish bond, c1740 for Stephen Croft (1712-1798), incorporating an earlier, Jacobean Hall probably built for Stephen's great-grandfather, Thomas (1619-1649). Having a sumptuous interior, attributed to the influential Yorkshire born architect Lord Burlington, (Richard Boyle, 3rd Earl of Burlington 1693-1753), designer of the Assembly Rooms at York, it was surrounded by magnificent gardens and eight acres of parkland. 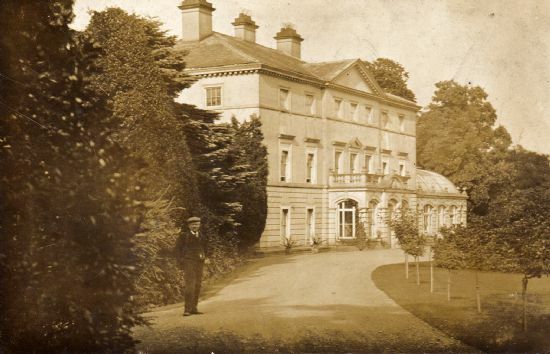 Twice during the 19th Century the Hall was rented out by the Crofts - firstly, for a short period in 1848 by Harry Croft (1779 - 1853) and secondly after the untimely deaths of Stephen Croft (1827 - 1871), and his wife Fanny (1829-1875) their son Harry being underage at the time. Sold out of the Croft family in 1894 by Harry Croft (1857-1926), it came into the hands of Rawdon Thornton, a businessman from West Yorkshire. 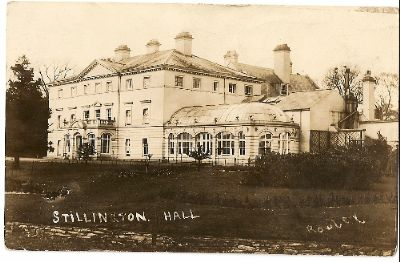 He sold up in 1903 and Matthew Liddell from Newcastle upon Tyne, whose family were connected with mining, made both the Hall and Stillington his home. The Liddells were immensely popular. 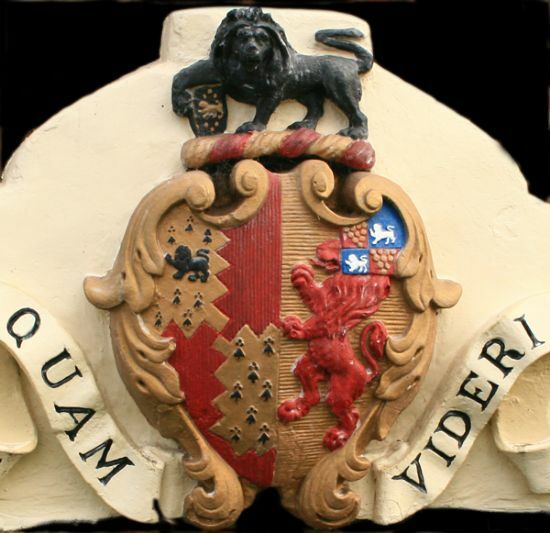 Matthew was known as 'The Squire', a term of affection for a man who turned Stillington Hall into a family home again and joined in village life wholeheartedly. Mr Liddell's death in 1934 was a blow. The Hall was put up for auction in Newcastle on the instructions of the executors of Liddell's will. It sold for an undisclosed figure to a mystery buyer who put it straight back on the market through an estate agent. 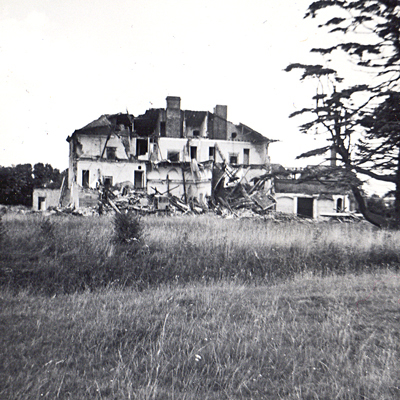 The Hall was bought the Alexian Brothers, a Catholic nursing order, who turned the Hall into a rest home. The order occupied the Hall from 1936 to 1948. 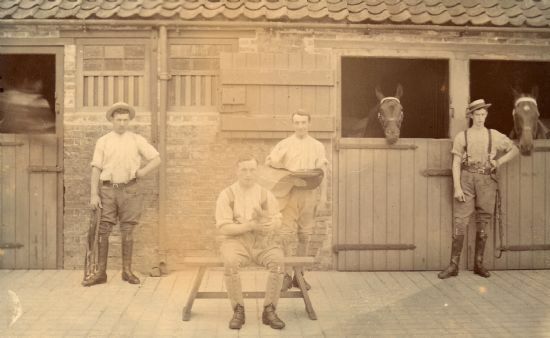 During World War Two evacuees, boys and girls from Catholic Schools in Hull and Middlesbrough, occupied the Coach House receiving good care from the Brothers. 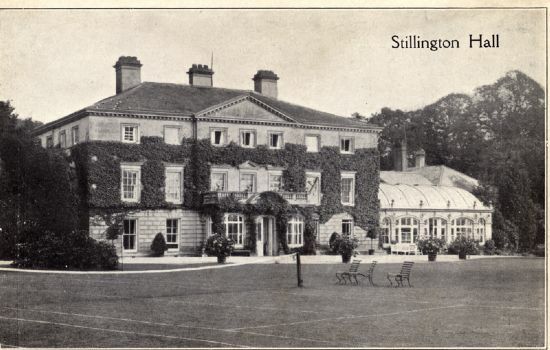 In 1949 the Alexian Brothers sold Stillington Hall to another Catholic order, The Verona Fathers, who were a missionary order. The Hall then became a junior seminary, taking in boys from all over the north of England and Scotland, who were to be educated to become missionaries in Africa. After five years plans were made to move away from Stillington. The Hall was expensive to run and it was felt that Stillington was a little remote. However it was another seven years before the order moved out, to Mirfield. In the meantime money that could have been used to maintain Stillington Hall had been spent on the new seminary in Mirfield. 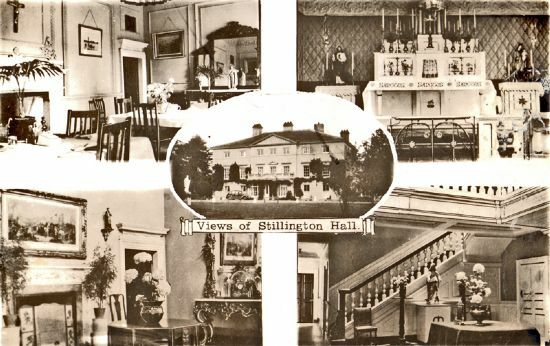 Stillington Hall was sold for £6,500 to a private buyer. Various schemes were put forward for its use, such as luxury flats, a private school and a country hotel. Nothing came of these plans. Meanwhile the Hall stood empty. 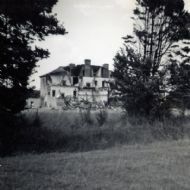 Neglected beyond repair it was demolished in early 1967.
the picture is taken from The Park, (note the Ha-Ha wall in foreground), looking at the south elevation of the Hall. This was situated at the eastern end of what is now known as South Back Lane.The buildings have now been converted into houses. Looking east, along the grand sweep of drive with Spencer Corbett, the Hall's Head Gardener, in the foreground. 5/9/1922 The Hall entrance off Main Street. 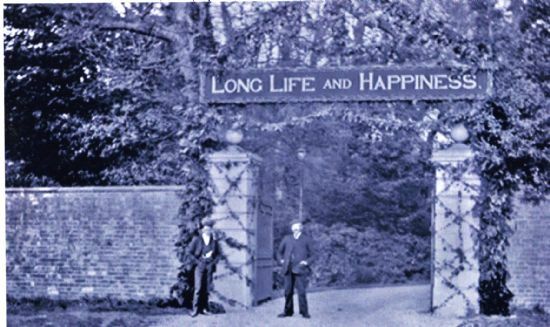 The gates were decorated for the wedding, in London, of the step daughter of Squire Liddell, Rose Mary Vernon-Harcourt. The gate pillars and wall still exist today. The inner hall and stairway. 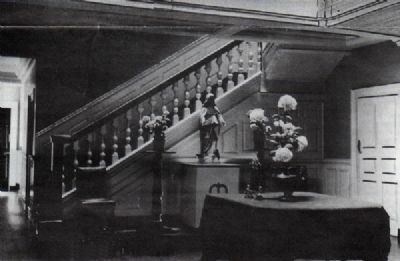 The elegance of the stairs and the craftsmanship displayed in the ceiling above were often noted by visitors to the Hall. 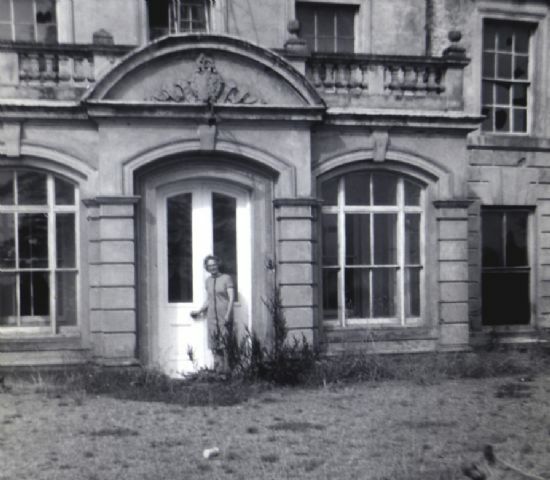 The staircase and much of the panelling in the hallway were attributed to the earlier, Baroque Stillington Hall, built for the 2nd Thomas Croft (died 1711). Date unknown but probably 1930s, note the tennis court front left of picture. 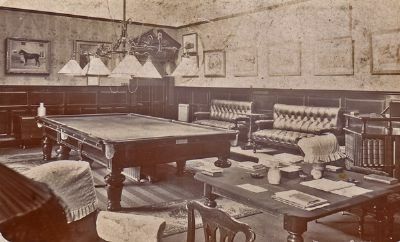 The use of a billiard room was one of the facilities of the 'Retirement Home for Catholic Gentlemen' as advertised by the Alexian Brothers. 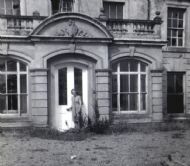 Mrs Rene Manson at the main entrance to the Hall. Note the Coat of Arms still in place over the door. Once located above the door to Stillington Hall, the coat of arms was rescued by Mr & Mrs Cussans and can now be seen on the wall of 1, Mossy Terrace. 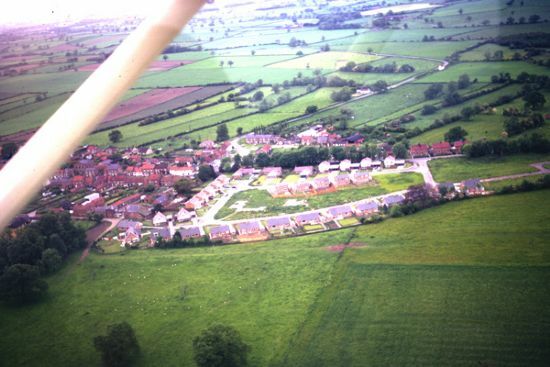 Partly built Parkfield Estate from the air. 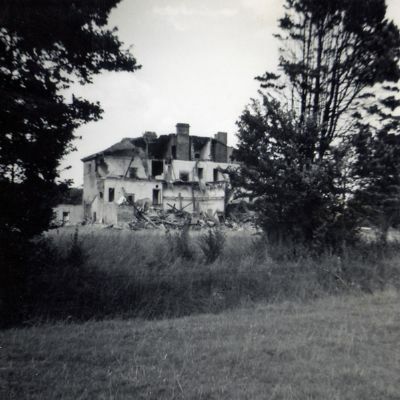 Two phases of building had already taken place and a third would follow, on the land to the right in the photograph.